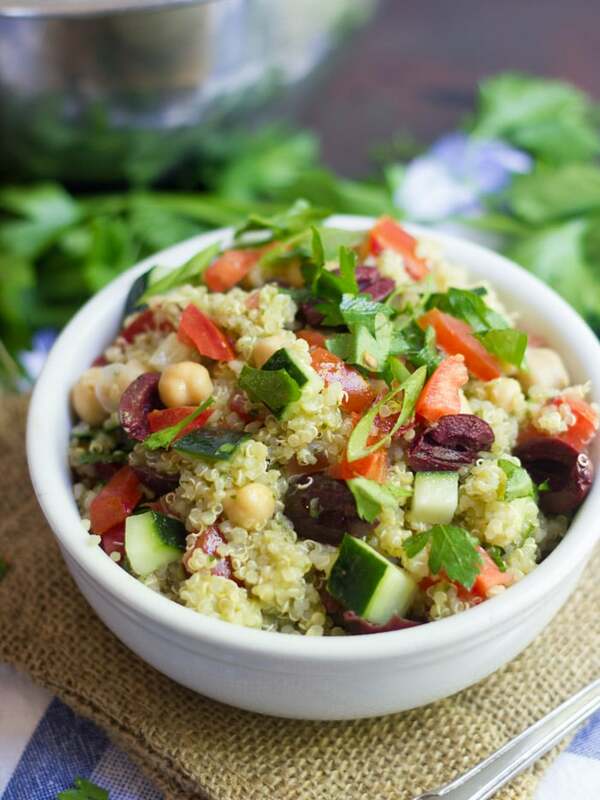 With fresh herbs, crisp summer veggies and a tangy lemon garlic dressing, this Mediterranean quinoa salad is sure to be a hit at your next summer cookout! I couldn’t let a holiday weekend show up without sharing some summery salad goodness. I made this a couple of times. The first version included dill, but no mint. I wasn’t into it. The dill just seemed really overpowering to me, but my husband loved both versions and I promised I’d mention in the post that the mint could be swapped out with dill. He actually asked if I could post both versions, like as completely separate recipes. I don’t generally do that though, so I’m letting you know that my husband says the dill version is good! Just swap out the mint with an equal amount of dill if you want to make that one. So let’s talk about my preferred version of Mediterranean quinoa salad. The mint version, or rather, the mint, parsley and scallion version, because it has all of those things in it, and they work really nicely together. It’s pretty much exactly what I crave this time of year. You can do that too, but since we’ve got a big barbecue weekend coming up, why not feed this to your friends and family as a fun side dish and way tastier alternative to all the creamy, potatoey, pasta-fied things you usually see at cookouts? They’ll love it. Like I said, you can swap out the mint with dill, but you can also switch up the herbs or use more or less to your taste. Fresh chives, cilantro, or basil, while not quite as Mediterranean as the herbs listed in the recipe, would probably be delicious in this. Not into quinoa? Try subbing pasta, farro, millet. Just cook according to the package directions. This can be made up to a day in advance, as long as your herbs and veggies are very fresh. 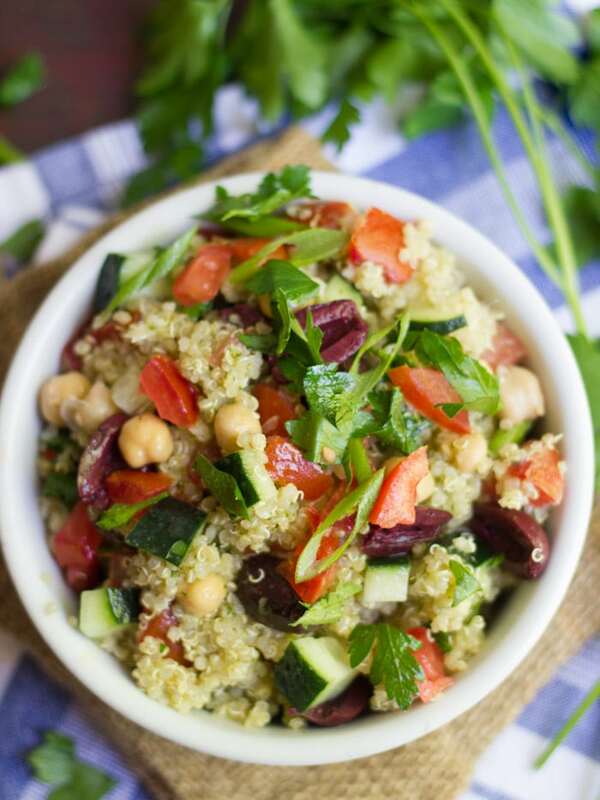 With fresh herbs, crisp summer veggies and a tangy lemon garlic dressing, this Mediterranean quinoa salad is sure to be a hit at your next summer cookout. Rinse the quinoa well under cold running water (you can skip this if the package tells you it's already rinsed). Place the quinoa into a small saucepan with water and place over high heat. Bring the water to a boil. Lower heat and cover. Allow to simmer, covered, until all of the water is absorbed, about 20 minutes. Remove the pot from heat and allow to sit, covered, for 5 minutes. 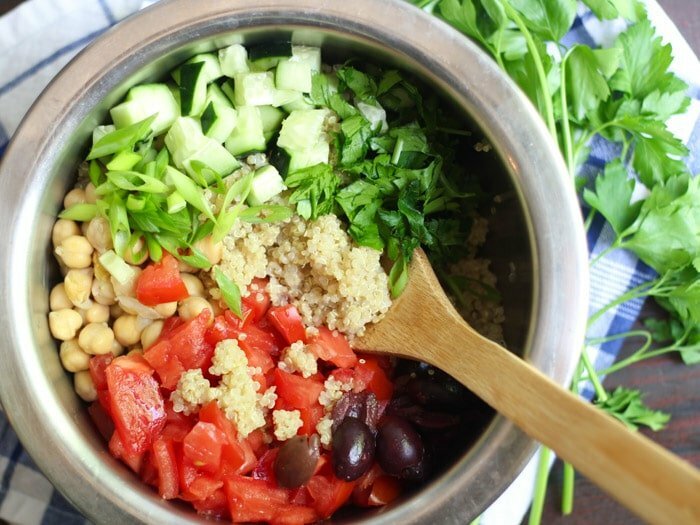 Transfer the cooked quinoa to a medium bowl and allow it to cool completely. Stir remaining ingredients into quinoa. Taste test and adjust as needed. Thanks so much Jackie! I hope you enjoy it! I made this before and my family liked it so I am making it again for a family party for this Satturday and I hope everyone will like it ? ? ?? Glad you liked it! I hope your family does too!! Delicious! Even though it’s January, I like to cook summer type meals. I’ve read that if you eat lite meals , it helps to ward off hibernation mode. l? Not sure how much truth to this theory but I’m sticking to it. Anyway, loved this salad! 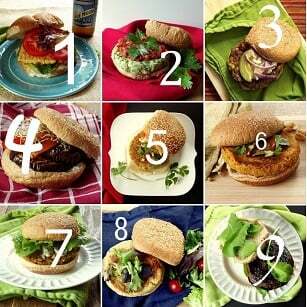 I have tried several of your recipes and have loved every one of them! Thank you for healthy, easy meals. Trying the morning glory cookies this weekend? So glad you enjoyed it! I’ll have to try the summery meals thing – lack of daylight and cold temperatures definitely have me in hibernation mode. I hope you like the cookies too! I’m making this again for Memorial Day! It’s my family’s favorite!